Illustration of how the sun's been beating up on Mars for billions of years. NASA has already found signs of liquid water and ice on Mars, and scientists have long thought that the Martian landscape once hosted big bodies of water. The question has been: How did Mars turn into the dry, dusty, and chilly barren planet? New data from NASA’s MAVEN (Mars Atmosphere and Volatile Evolution) mission is now giving scientists a clearer picture of Mars’ fate. 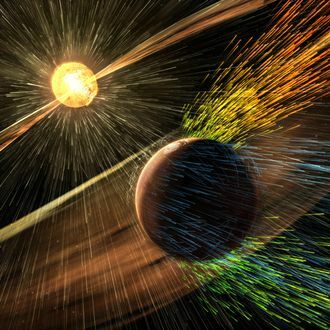 MAVEN, which orbited around Mars for a little more than a year collecting information, has found evidence that solar winds eroded — and continue tearing away at — the Martian atmosphere. The solar winds are really just a mass of speeding protons and electrons that enter Mars’ atmosphere at a rate that kills your marathon pace at 1 million miles per hour. These particles charge the atoms in Mars’ atmosphere, so they basically can’t stick around and shoot up into space. NASA says Mars loses about an average of 100 grams of its atmosphere gases per second. "Like the theft of a few coins from a cash register every day, the loss becomes significant over time," said Bruce Jakosky, a professor who worked on the MAVEN project. These solar winds continue to chip away at Mars’ atmosphere, piece by piece, but most of the damage was done billions of years ago*, when the sun was still in its rebellious teen phase and its winds were much stronger. But could this ever happen on Planet Earth? In theory, yes, say scientists, but it’s pretty improbable. According to the Washington Post, lucky Earth has one thing that Mars does not: a strong magnetic field, which serves as a barrier to those solar winds. Though the sun’s charged particles do enter our atmosphere, we’d have to lose our magnetic field to turn into Mars, which will likely not happen. These solar winds also give Mars its own aurora borealis, but the lack of magnetic field means the lights comes much closer to the Martian surface and spread out much farther than any on Earth. So now that we know Mars was probably once wet and warm, and is now a wasteland getting pummeled by solar winds, the big question is: Who’s ready to visit? If it sounds appealing, you’re in luck — NASA is hiring! Really, the Space Agency needs some astronauts in anticipation of renewed space exploration, and eventually, the possibility of a manned mission to Mars. A minimum of a bachelor’s degree in a STEM field (but an advanced degree is preferred) and only three years of related professional experience is required — or more than 1,000 hours of pilot-in-command time in-jet. Candidates must also pass a physical exam. This is probably just to get your application past HR, though, as the hiring process is going to take years; NASA won’t let you know you’ve got the job until mid-2017. So if you can’t wait that long to visit the International Space Station, maybe start with adult Space Camp? No longer just for winners of Nickelodeon game-shows. * Correction: This story originally said "hundreds of billions of years." We apologize for the error.